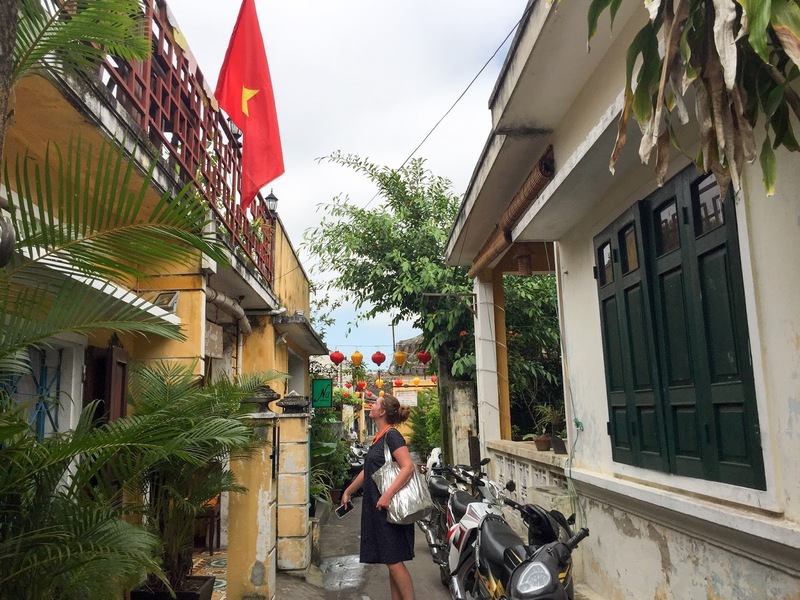 On the last leg of my 2 week trip across Hong Kong and Vietnam, we stopped in Hoi An, roughly half-way up the country. 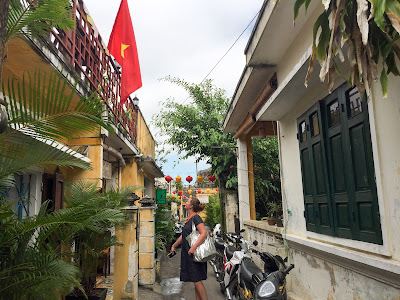 To get there, we eschewed another plane and instead took an overnight train from Saigon, which had positives and negatives; it's a nice, relaxed way to travel especially if you book yourself into a soft-berth air conditioned carriage. 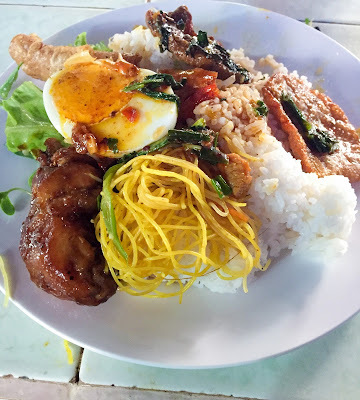 Unless there's four of you you will have to share - we had a young Vietnamese woman and a businessman to share with, and they just went straight to sleep. Downsides were that the toilets were pretty revolting, and absolutely everyone tried to rip us off. We woke up to a train attendant yelling at us if we wanted baguettes for breakfast, which in a sleepy stupor we agreed to, were flung said baguettes, a whole pack of Laughing Cow cheese triangles, and then a huge sum of money was asked of us. 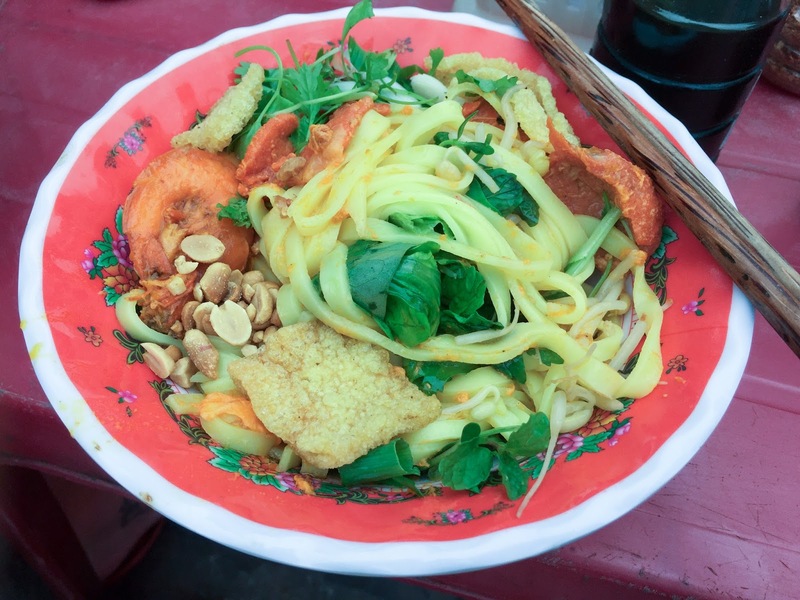 It was about £3, but huge in Vietnamese standards. Our Vietnamese bunk bed companion had an out-and-out shouting match with her in our defence, and then implored with us from now on to only order food via a Vietnamese person. Not cool, Vietnamese train people! Not cool. We used these guys to book the tickets and they were great; Vietnam Railway's website doesn't take foreign credit cards. 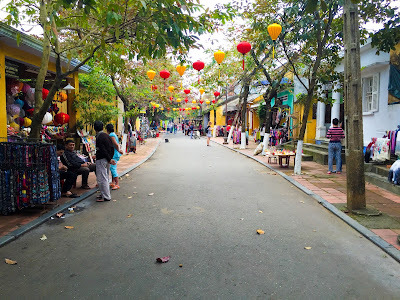 But, whatever, we got to Hoi An and it was 10 degrees cooler than what we were used to, though the sun soon popped out. 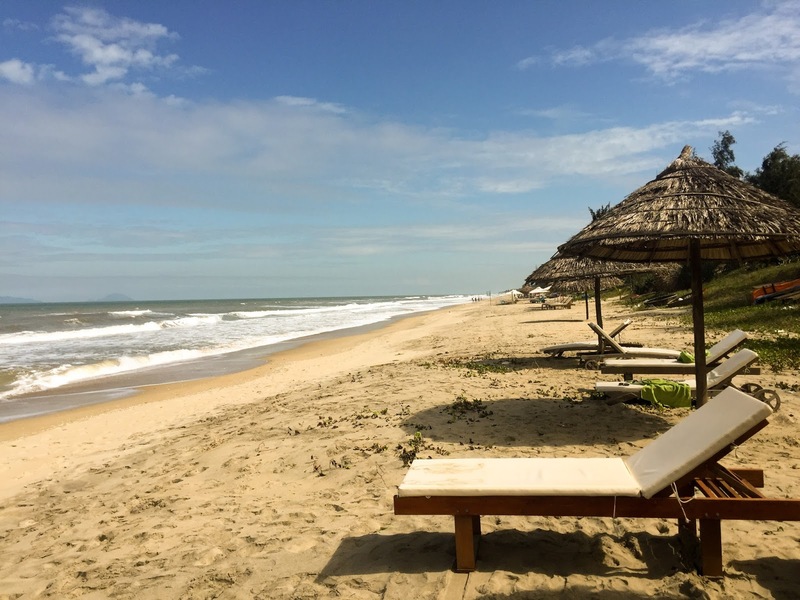 We had a beautiful beach villa at Tan Thanh Garden Homestay, which I would absolutely recommend. The people there were really lovely, and while breakfast was a little haphazard (just make sure they have written the time you'd like it served down correctly...) it was incredibly delicious and generous, and all the herbs and vegetables come from their own garden. BEST DOG EVER. 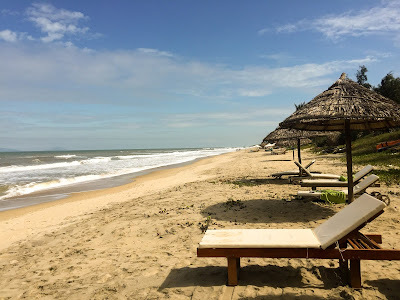 It's a little out of town, a good 10 minutes in a cab, but I liked staying out of the hustle and bustle of one of Vietnam's most touristy towns, plus going for a run down the beach is rather refreshing, if you're that way inclined. Hoi An itself is a large town, and mostly characterised by the Ancient Town, pedestrianised (except the ubiquitous scooters) and preserved as a UNESCO World Heritage site. 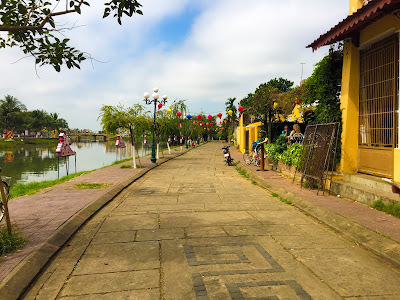 It's intersected with canals, which splits Hoi An up into separate islands connected by bridges. It's an incredibly beautiful place. 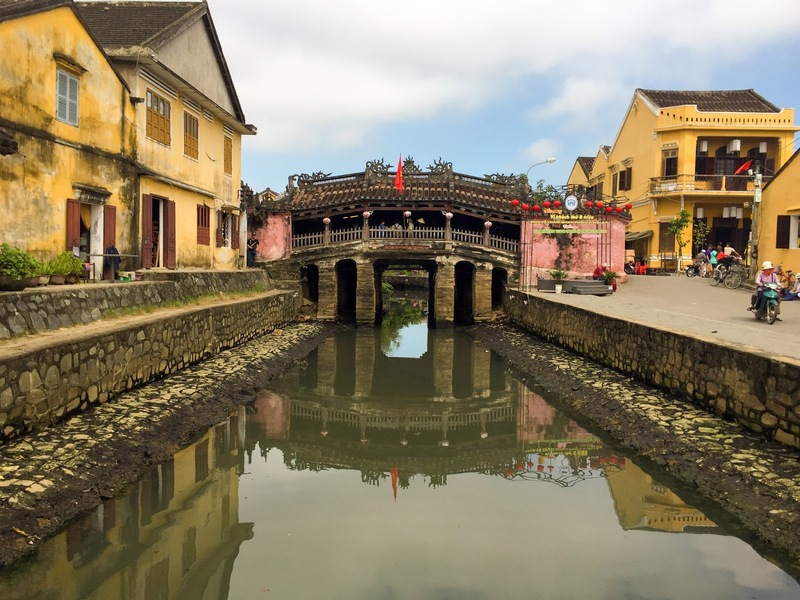 Old Colonial-style buildings frame the waterside, and every alleyway is as pretty as a picture. Back in The Olden Days (history isn't my strong point, guys) it was regarded as an very important fishing port, and the waterways are still lined with boats, though these days they're full of touts offering to take tourists down the waterways. 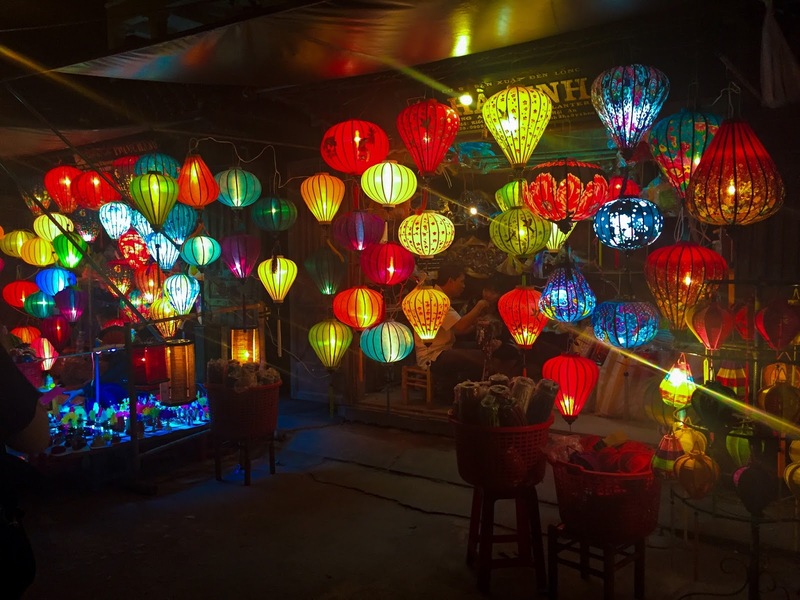 There are people selling things everywhere; trinkets, souvenirs, clothes, and silk lanterns of which there must be millions. Hoi An is well-known for tailors, and sure enough the number of tailors there was quite outstanding. We were told by our homestay not to bother with the smaller shops, who send all their tailoring to the larger companies to be done anyway. Instead, we took a recommendation and had our clothes made at Kimmy's. It's not as cheap as you might think - ranging around £60 for a custom-made dress depending on the material you pick - but it does mean I have a perfectly fitting jumpsuit which is normally incredibly difficult for a person of my diminutive stature. 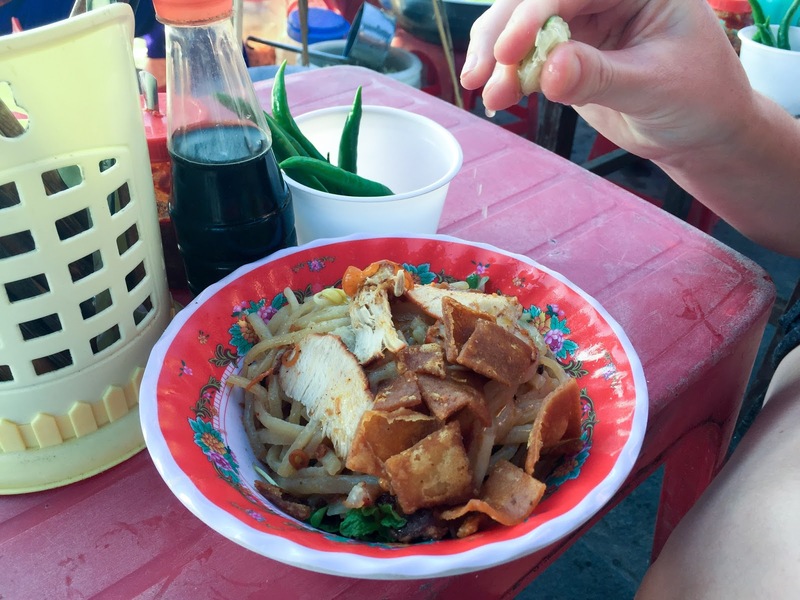 There's also people selling food everywhere, so much so I wondered how we would fit it all into our 5 days there. Day and night the vendors change, so early on the noodle stalls are set up, while towards the afternoon the wafts of meat barbecued roadside permeate the air. 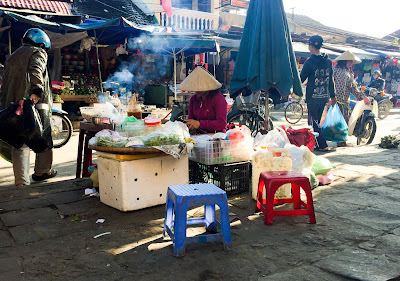 The Central Market, to the east of the old town, is packed full of of vendors selling fish and meat, vegetables and noodles. 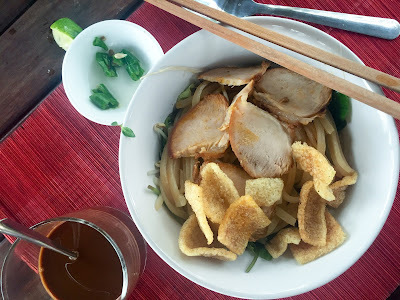 The speciality of Hoi An is 'Cau Lau', a noodle dish made up of thick noodles, specifically made with water from the wells of Hoi An, and coloured with ash from nearby Cham island. 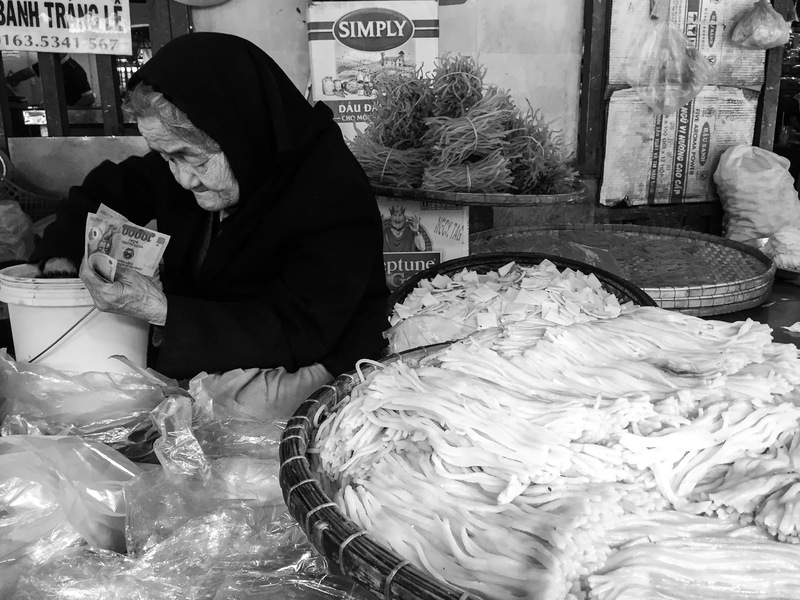 This lady sold them dried and fresh; she waved us away to gawp at something else, so she could serve others quicker. 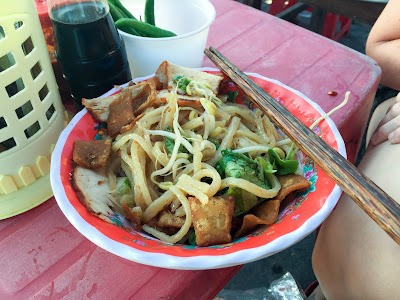 Cau lau is a mixed noodle dish, as opposed to a noodle soup. The thick, chewy noodles are dressed with a thick, flavoursome lard-heavy pork stock, topped with beansprouts, pork and fried pork rinds. Herbs, of course; lettuce, coriander, sometimes mint and the dreaded fish leaf. Chillis on the side to be mashed up with lime juice and to season each mouthful as a par for course. Mi Quang is another noodle dish popular to the area, but extended out to include the town of Da Nang. Here, we have yellow noodles, with seafood added to the mix, and topped with shredded banana flowers, peanuts, herbs and sesame rice crackers, puffed over an open flame. At nearly every street corner, and in the market, ladies grilled skewers of marinated pork over charcoal. 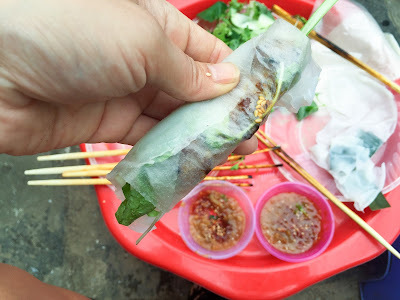 At 10,000 dong per skewer, you're automatically served a fistful unless you insist otherwise (they become something of a hefty meal once wrapped). 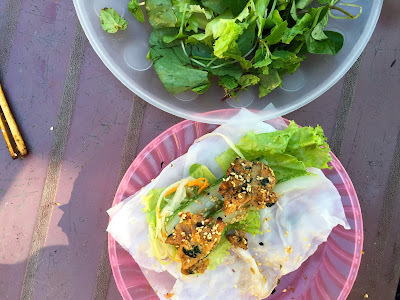 Initially perplexed, with a grin one lady gathered up a rice paper sheet, lined it with lettuce and herbs, and then placed the skewer within and pulled the meat off. 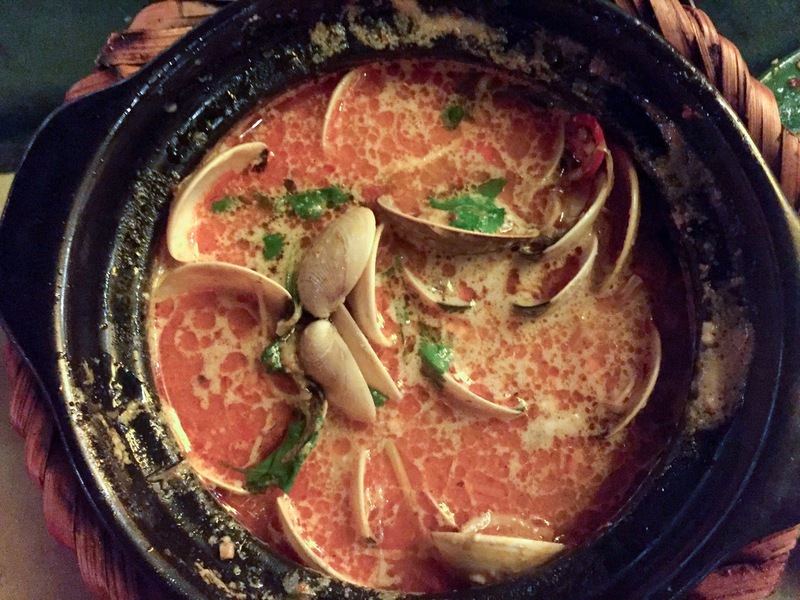 I dived in and extracted that fish leaf while I could. Neatly, the skewers are split down the middle to accommodate the meat, and deftly tied together at the tip with banana leaf. Dipped in a spicy peanut sauce, this was my absolute favourite snack. Afterwards, she tenderly wiped a sesame seed off my chin. Tourists gaped at us, flummoxed that a pair of white girls would be sat street-side on tiny plastic doll-sized chairs, while I still remain flummoxed with all the tourists too scared to try. A slow, steady finger was raised when they attempted to take a picture of us. 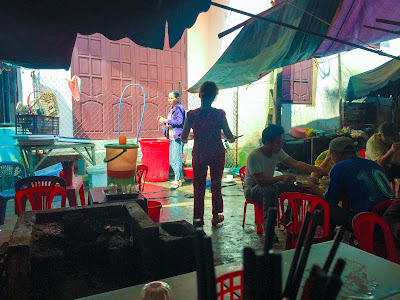 Bale Well is a restaurant hidden down an alleyway but well sign-posted, and they are menu-less, only serving these skewers with wrappers, but also with spring rolls, and the famous Vietnamese pancake, banh xeo. 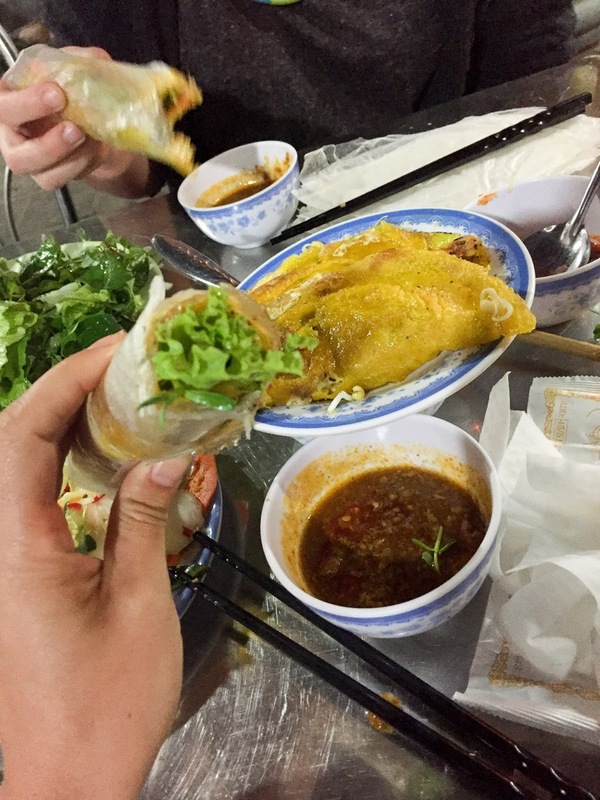 It's a wrap, roll and dip affair, and their exceptional dip sauce is reportedly made with chicken livers for extra richness. 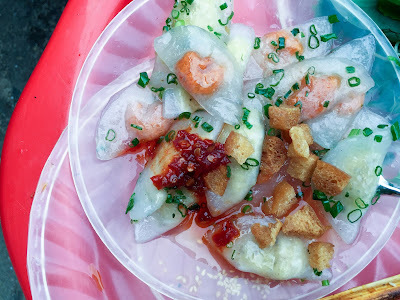 Not the most photogenic of dumplings, 'white rose' are also something of a speciality in Hoi An. 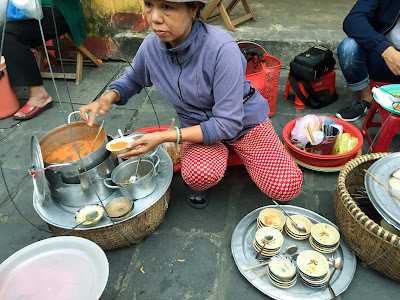 On the street, they wrap shrimp, or egg and the splash of chilli sauce is vital to save them from blandness. 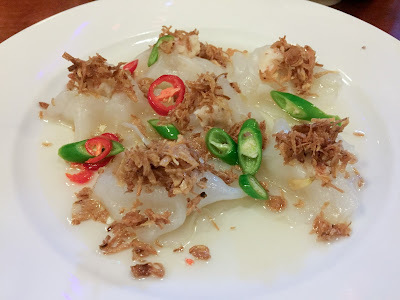 We also tried them at Miss Ly's Café, supposedly the best place for it (and we did have a tasty dinner there) and you know, they're nice but they're not going to blow your mind. What absolutely did blow my mind, though, was this lady. I wouldn't have given it a second look except I spotted a man perched with her, and the number of tiny bowls piled up in front of him was almost comical. What could be worth eating over and over again 10 times? Called Banh Beo, it's a steamed rice cake, topped with a rich pork and crab broth, and deep fried cao lau noodles. Crunchy, creamy, bouncy. The real kicker was white vinegar and green chillis, which the lady initially splashed on cautiously, until under encouragement, more freely. It was incredible. Also incredible was this 'dau fu fa', which if you've spent any time in Hong Kong, you'll recognise as 'tofu flower dessert'. 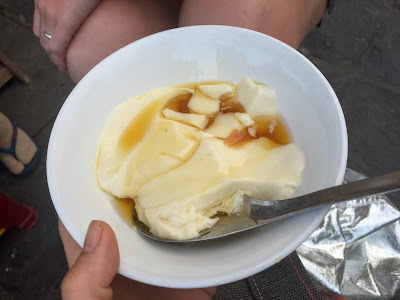 Here it's scooped warm out of the container, into the bowl with a warm ginger syrup. Soothing, comforting and the perfect afternoon pick-me-up, I also had it garnished with ice on a particularly warm day. I could hardly go to Vietnam without trying the famous 'banh mi' sandwich. You'll recognise Banh Mi Phuong by the queue of locals and tourists alike outside, waiting patiently for their sandwich. 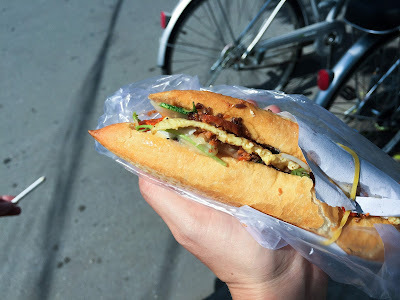 Banh mi actually refers to just bread, and there were 18 or so different options of fillings to choose from. 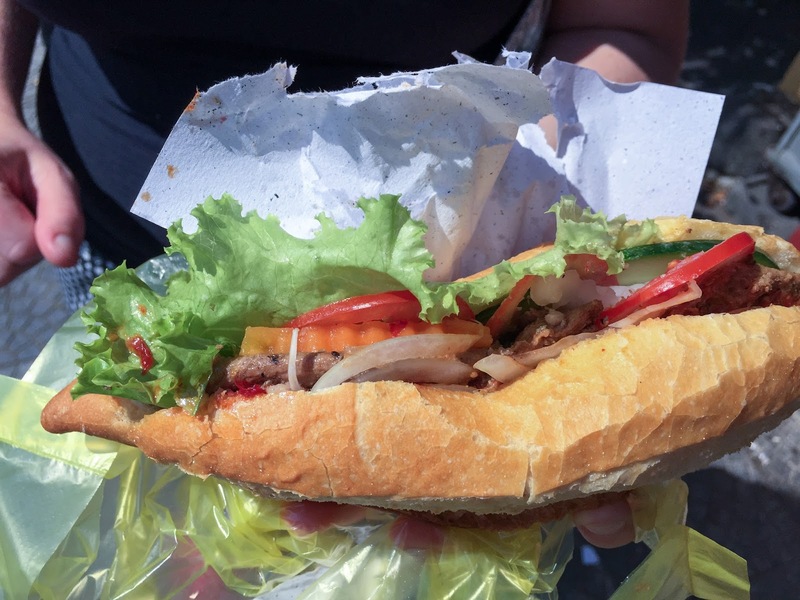 Barbecue pork seemed the most popular; the bread, which looks like a baguette is actually made with rice flour so is a lot lighter than the French baguette you or I might be used to. Smeared with a coarse pork paté, it's loaded with smoky pork, pickled carrot and daikon, and chilli. 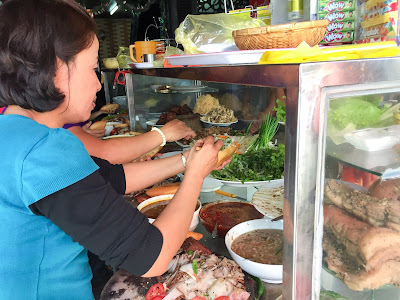 Anthony Bourdain has made both Banh Mi Phuong and 'Madam Khanh - Banh Mi Queen' famous, and both are indeed very good, though for my money Banh Mi Phuong pips it. Madam's was stuffed with omelette and herbs and while it was nice, I thought it lacked some punch. I love being on a bike, and Hoi An is perfect to explore as everyone else is on one. The roads may seem a little busy at first, but everyone drives really slowly so they're super predictable. 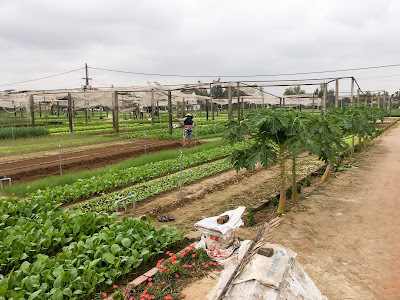 I cycled myself out to Tra Que Vegetable Village, about half an hour's cycle outside of town, passing rice paddies of farmers in conical hats, water buffalo lazily traversing fields. They're known for farming organic vegetables, using only the algae that grows around Hoi An as fertiliser. You can take tours, but I found it very peaceful just walking around on my own and identifying the different vegetables and herbs. On my way back into town, I pedalled past a bustling wet market and lots of people sitting to eat. I screeched to a halt, parked up my bike and nosed around. I'm not sure the locals this far out of the old town had much experience with tourists, as I was a real hit - eyes followed me everywhere, but not unpleasantly. More curiosity. I sat down with my pick n' mix lunch, and an old lady gestured towards a giant pile of birds eye chillis, beckoning one. I handed a couple to her, and with a toothy grin she chomped it right in half, chewing the chilli. When she offered me the other chilli, well - who was I to decline her hospitality and say no? I chomped it in half and chewed. Jesus Christ. JESUS CHRIST. She looked so impressed it was almost worth it. My nuanced flavours of caramel pork, egg, deep fried fish cake and rice were obliterated. But I'd made friends. On our last night, a dinner proper - Morning Glory is well worth booking. They also run Ms Vy's Cooking School, and a selection of courses. I wish I'd done the Advanced Masterclass; the one we did do, with Red Bridge Cooking School, was great and we enjoyed the market tour and the river cruise that took us there, but the cooking itself was dumbed down to the point where I had to tell my 'helper' to please leave me be as I can turn an omelette thank-you-very-much. 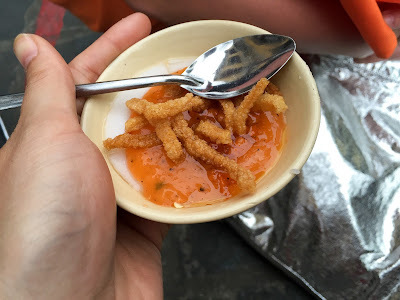 Anyway, everything we had at Morning Glory was incredibly delicious, from the red curried clams, to the stir-fried bitter melon with egg, as well as the papaya salad, oh and some summer rolls, and a pineapple and tomato sweet and sour fish soup that I will definitely attempt to recreate. Our eyes widened at the bill, and then we laughed at ourselves when we realised it came to £24 for the three of us, and we were stuffed to the brim. 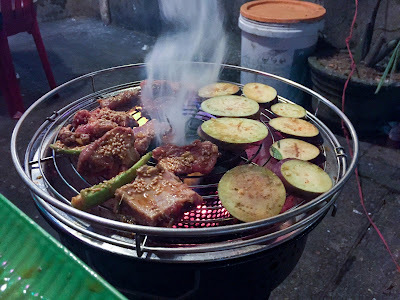 Besides one other dinner where we barbecued our own food, because, fun! We stuck to the streets, sometimes sharing a bowl here or there, or maybe a plate of chicken rice, followed by more snacks, a couple of beers, maybe a snack or two, ooh are they skewers? Another bowl of noodles, ad infinitum. Obviously, I had a very excellent time. All the instagram photos from my trip are viewable HERE.